Semiconductor Engineering - Cell phone optics, a production imprint application. Semiconductor Engineering - Cell phone optics, a production imprint application. Home > Manufacturing, Packaging & Materials > Cell phone optics, a production imprint application. Cell phone optics, a production imprint application. In all the discussion about the commercial viability of imprint, a manufacturing line has been quietly put in place to imprint lenses of cell phone camera chips. In all the discussion about the commercial viability of imprint, a manufacturing line has been quietly put in place to imprint lenses of cell phone camera chips. The company leading these developments is Heptagon with head office in Switzerland. At the same time, others are looking at the opportunity and bringing innovative technologies to add new features such as zooms, autofocus and image stabilization. By 2014, wafer-level optic shipments will reach more than 1 billion units (roughly 1M wafers) in sales, overwhelming conventional cameras. I first heard about Heptagon in 2003 when they were a small custom optics company spun off from CSEM, a private Swiss R&D company. 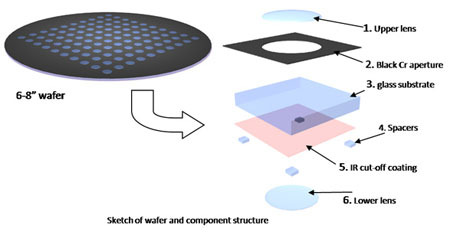 They developed a replication process to fabricate optics using a moldable material that can be processed through semiconductor equipment – meeting the “Telcordia” specification. Then the cell phone suddenly became a camera in disguise. The Heptagon approach allows an entire wafer of cell phones to be covered with lenses in a single operation. The cell phone has to be one of the most amazing “technology per $” deals, and uses a very cost sensitive manufacturing process. The Heptagon technology offered a key additional capability at a uniquely low cost. Heptagon set up a manufacturing arm in Singapore, raised $22M, and purchased some custom imprint equipment for EVG Group. A year ago they shipped their 100 M’th lens. At 1000 cell phones per wafer, that represents 100,000 wafers. Wafers scale fabrication of lenses is a particularly good match to an application where the cameras are fabricated at the wafer scale. This is obviously a significant production operation, although it probably requires only a small number of patterning tools. This points out the challenge in equipment manufacturing. If it’s a single application, even one of the world’s largest single product types may not support an equipment product line. The cell phone camera opportunity is attracting competition using miniaturization to enable unique technical solutions. Tessera have developed integrated optics, packaging and control solutions that do not use conventional motors. Based on patent disclosures, it appears they use a integrated flexure and electrostatic drive. Varioptic announced that it has developed a liquid lens for optical image stabilization. It is clear that we can look forward to cell phones and cameras continuing to blur (not optically ! ).